Now I do realize that a number of our readers are of the… ahh… GOP persuasion… and soooo, of course, you paid very close attention last week to the white house Resident’s latest budget proposal… you DID pay attention, didn’t you? All good, right? “Saving” trillions of dollars for the Military and Border Walls by stripping unnecessary, unAmerican, Socialist programs like Social Security and Medicare… I mean, who needs a social safety net? Not us two-fisted, loud-talkin,’ Back-to-the-Fifties (the 1850s, that is), Real ‘Murricans! But for any of you True Believers earning less than $100,000 a year, or with health concerns, or no prospects of retirement, aren’t you just the teeniest bit grateful to Nancy Pelosi and all those “Commie Liberals” in the House, who will make sure that Trump’s latest budget scam is DOA? Goshes… If Faux Noose says it, it must be true… Is that priceless bit of movie memorabilia, the Plywood Saucer from that cinema classic, “Zed-Men from Uranus” (don’t say it!) really destroyed? 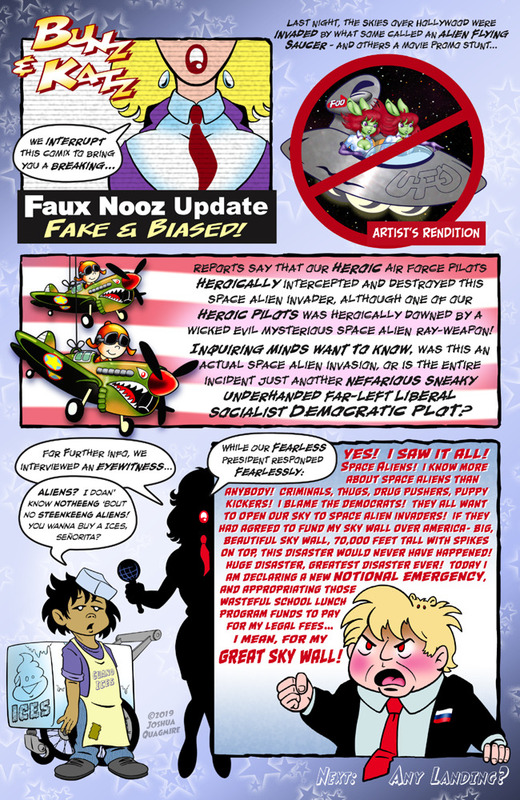 Are our fearless, funky anti-heroine and her faithful henchbot really hic jacet, kaput and finito? Is the Negafleet’s latest attempt to destroy those pesky simians infesting planet Dirt really doomed to failure? Are you tired of these pointless rhetorical questions? You sort’a need to Grok the buffoonery of the situation… Like ferinstance, over the past few days Chump has been repeatedly attacking a dead man in tweets and speeches – John McCain, who whether one agreed with his politics or not (and I mostly didn’t) was a True American Hero, who served with honor and who paid a high price for his service! Meanwhile, Prez Bone-Spurs through his irrational & unprovoked attacks on McCain’s memory only makes himself look sad and pathetic – and more than just a little bugf*ck crazy!! Think about it, suppose that Prez Obama or Hillary Clinton had tweeted anything like Chump’s attacks on McCain – the GOP faithful would be out with pitchforks and torches railing for their demise! But when Chump does it, all the lot of you do, is to sit on your Thumbs… Now that is pathetic! Probably. Politics has become a blood sport. Well then, Derwood Kirby? Cab Calloway? That guy who pushes a broom after the title intro of the “Peabody and Sherman” show? John McCain was a self aggrandizing, temper-tantrum throwing, political backstabbing git. (Just like Chump.) He was also a war hero. History books are replete with examples of people who were both. 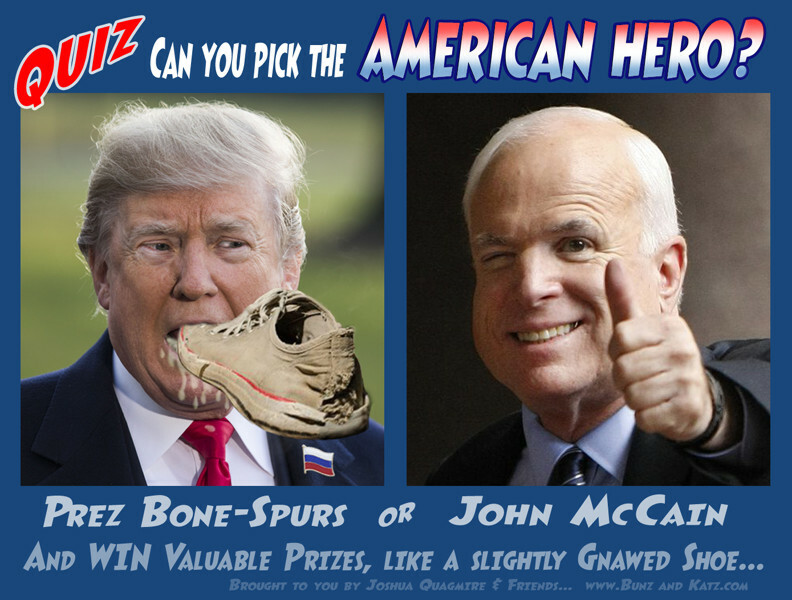 I suppose I should have been clearer with my wording of the Quiz thing… I did NOT agree with most of McCain’s politics either, but when I put this together I was thinking primarily of his Military service and the time he spent in the “Hanoi Hilton”… To myself, any who served with honor and especially those who paid the price of death, injury or captivity – they are ALL HEROS! But then I’m speaking from the viewpoint of an old decrepit Marine (Avionics Tech) Myself, though I never was in combat, never did anything heroic – I do respect those who did! !